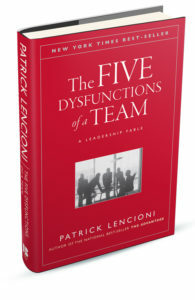 Based on the work of Patrick Lencioni’s international best-seller The Five Dysfunctions of a Team. What is The Five Behaviors of a Cohesive Team® Powered by Everything DiSC®? 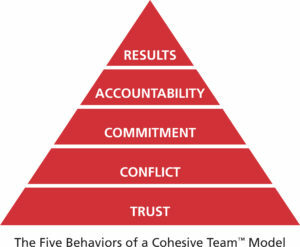 Based on the work of Patrick Lencioni’s international best-seller The Five Dysfunctions of a Team, The Five Behaviors of a Cohesive Team® Powered by Everything DiSC® helps teams apply The Five Behaviors™ model of Trust, Conflict, Commitment, Accountability, and Results to drive team effectiveness and productivity. The program uses Everything DiSC, a tool that helps build effective team communication and relationships, to help participants understand their individual DiSC® style and discover how each style brings value to the team. 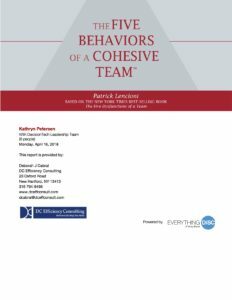 Contact us or call 315-794-9495 for more information regarding The Five Behaviors of a Cohesive Team!